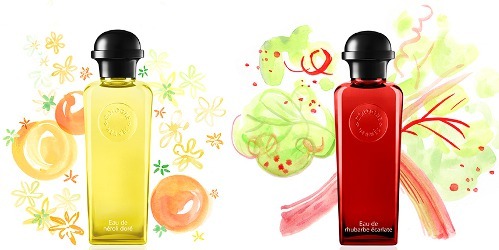 Eau de Rhubarbe Écarlate and Eau de Néroli Doré are the latest additions to 'Les Colognes' at Hermès. It is not my favorite collection — I own a lot of Hermès fragrances, but only one from this series, Eau de Pamplemousse Rose (I do also keep a small bottle of the older Eau d'Orange Verte, which was repackaged into this series in 2009). But still, I'm always glad to see something new from the brand that takes most of my perfume dollars, and I was especially curious since the rhubarb is the first fragrance for Hermès signed by perfumer Christine Nagel, who joined Jean-Claude Ellena as house perfumer in 2013. Eau de Rhubarbe Écarlate is, as I said above, the Christine Nagel scent, and the description, "the crisp and tangy freshness of rhubarb softened with white musks", is pretty accurate — despite the brand's usual reticence about disclosing detailed fragrance notes, it pretty much tells you what you need to know. If you're a rhubarb fan, the top notes will probably please you, as they are indeed crisp and tangy, with a lovely juicy citrus backdrop and a mild green edge. After that, yes, it all gets pretty soft, and as you might suspect from the white musk, it gets pretty clean to boot, although it does not quite scrub itself into laundry-soap territory. There's a thread of wispy / sheer / pale rose-y florals, and a bit of a mild wood note. Eau de Néroli Doré is the entry from Jean-Claude Ellena. The description, "the lively and generous freshness of neroli enhanced by saffron", is again accurate, but after a bright but muted opening of citrus and spiced orange blossom, the scent itself was something of a surprise. It's not Opium or Angel, of course, but for a Jean-Claude Ellena fragrance in the Cologne series from Hermès, or even for a neroli, maybe, it's dense and rich, and while it lacks Eau de Rhubarbe Écarlate's opening punch (when I first sprayed the two, I thought for sure I'd like the rhubarb better), I found it more rewarding to wear. It isn't overly decorated, and as with the Rhubarbe, the base is mild and clean, but the neroli shines in a 'bathed in golden light' sort of way that meshes perfectly with the name and the bottle color. Verdict: I will not be surprised if the Rhubarbe Écarlate is the better seller, but the Néroli Doré is, to me, the more interesting scent. More than a summer cologne, it smells like a meditation on its namesake ingredient,2 and as such it would have fit nicely into the original Hermessence quartet (Rose Ikebana, Ambre Narguile, Vetiver Tonka and Poivre Samarcande), which was more tightly materials-oriented than the Hermesssences that followed. I've been plotting a coffret order from Hermès but waiting to see how I liked these two. Néroli Doré will go on my short list, which unfortunately at the moment is not quite so short as the four you get in the coffret. So we shall see. Still, neither of these fragrances are likely to make their best showing during a Pennsylvania February. They are both going in the purgatory basket, and I'll take them for another spin when proper cologne weather starts. Soon, I hope. Hermès Eau de Rhubarbe Écarlate and Eau de Néroli Doré are available in 100 ($129) and 200 ($175) ml Eau de Toilette, or in the choose-your-own 15 ml x 4 coffret collections ($124). 1. And I wish I had a sample of Comme des Garçons Rhubarb (from Series 5: Sherbet) to compare, but if memory serves, I liked that one better than this. The price has gone up quite a bit since I reviewed it, but it's sold in a small size: 30 ml for $55. So it's more per ml, but to me still a better bargain than the Hermès. 2. Widely reported from the press event for the new colognes: "...Ellena explains that ‘When I started out as a perfumer I learned to distil raw materials, including orange blossom. When you enter the world of stills, you are also immersed in a scent, impregnated with it, you become it. To reproduce this sensation, where normally one uses very little neroli in fragrances, I used it abundantly.‘ So abundantly, in fact, that he says Hermès had to buy half of Morocco and Tunisia’s entire annual crop of neroli oil for the perfume." Via Wallpaper. We all know that a lot of the marketing and backstory for new fragrance releases can be ignored, and I do ignore it usually. But that one detail slipped in from the side, that Hermes had to buy half of Morocco and Tunisia’s entire annual crop of neroli oil, lures me in. (That and the saffron.) It’s fun to imagine the execs at Hermes staring at each other wildly – ‘He wants HOW much? ?’ And the producers in Morocco and Tunisia grinning to themselves. ‘Ah, that Monsieur Ellena … ‘. Where I live the distribution of the Hermes Colognes is a bit patchy, but I hope very much to run across the Neroli. Rhubarbe? Meh on that. I am not interested in the natural vs synthetic debate per se, but if nothing else it’s nice to know somebody cornered part of the market on a real flower and now you’re wearing it, LOL…whereas any rhubarb you wear came out of a lab. Thank you for such a wonderful and anticipating review. But still I haven’t understand how Neroli Dore smells… Is it close to Neroli Portofino? More intense than Neroli Portofino? Is it spicy in the base or sweet? What other neroli fragrances does it remind of? Neroli Portofino is more of a general classic citrus-herbal cologne, and it does have some neroli but it does not strike me as heavy on the neroli. And I’m afraid I don’t think much of it, or really more accurately, I think it’s a nice but wildly overpriced classic citrus-herbal cologne. This is much more focused on the neroli note, and it does not have the herbal notes or really a classic cologne structure at all. I’d call it mildly spicy, mildly peppery, and the spices are kept in a bright register rather than warm. It reminds me vaguely of Maître Parfumeur et Gantier Eau Pour Le Jeune Homme, but that one is spicier and heavier on the citrus. Robin – I can’t wait to see when you finally buy something. I think you made it through 2015 without buying anything — I’m curious to see what you end up with! The JCE sounds great! I am not much for colognes because of their lasting power and often citrus-y ingredients (of course, not all — and I like many Ateliers, et al. ), but I have a vintage Helmut Lang EdC with rosemary that is really interesting and long-lasting. The Hermessences have an 8 pack option. A few more colognes and that will be viable! My problem is that I do not need 8. I have all of them that I want, except nearly out of Osmanthe Yunnan. I wish I had one of each of the hermessences but of probably only pay for 6 of them, even in 15ml. Ha! I must have missed that post! I’ll try them whenever I get the chance. I am always wishing every brand did these coffrets, but it’s just as well that they don’t! Definitely keeps my spending down, since I don’t like to buy more than 15 ml of anything and I avoid rollerballs when I can. Thank you for the reviews! I’m pretty sure I’m going to get one of those rhubarb shower gels for spring. And while I have two Hermes 4x15ml sets, I could easily see myself getting two more. I love that concept (especially that you can pick and choose) and I love the size. Inspired by the review, I got out my stash and now have Osmanthe Yunnan on my left hand and Eau de Narcisse Bleu on the right. I’m always afraid that I’ve only imagined liking Narcisse Bleu – it’s crisp and understated and I’m not. But no, I really do love it. I love it, too — a wonderful springtime scent! And NB is the best color of them all! But sadly I do not love it. I was just at Saks for retail therapy and I either spaced out on the Hermes counter or maybe it’s no longer there? Anyway, I’ll need to stop by Bergdorf or the Hermes boutique so will get to try these soon! Nice reviews! Robin, if you can’t narrow down your choices, you should just go for two sets! Donatella is very forgiving! Thank you for these reviews, Robin — I’ve been eagerly awaiting your take on both of these. Need to get my mitts on samples of both; like you, I’ve been delaying purchasing a coffret until I decide whether either of these needs to be in it. Ah, then do try them! If you’re in the US, you’ve got a wait probably until they’re available in the 15 ml. Right now they’re shown on the French site but not on the US. I like the burst of rhubarb from Olfactive Studio’s Flash Back. That initial pink-green brightness is so invigorating!! So, I am looking forward to sniffing both of these, sooner or later. I would call this one invigorating too, at least, in the top notes. So hopefully you’ll love it. I tried both of these last week at the San Diego Hermes boutique. Like you, on first sniff, I was sure I would like the rhubarb better, but in the drydown preferred the neroli. The neroli really is so comparatively quiet in the opening…it is not trying to sell itself. It sounds like my credit cards are safe. I’ll probably try the Nagel rhubarb out of curiosity, but it sounds like JCE has brainwashed her quite thoroughly. I tried both of these for the first time today and I’m hopelessly smitten with Néroli Doré. It’s just so incredibly lovely. I think I like the Rhubarb better than you do, but Néroli is the clear winner for me. Both of these are currently available as free samples at Sephora.com. I tried the Rhubarbe. I agree with you – the opening is bright and sparkling rhubarb, and then…the same old white musk base you can smell in a million perfumes. It makes me miss the Guerlain city exclusive for London, which I was lucky enough to grab a large sample of and which was a good quirky rhubarb!